Fall Sangria. Fall Harvest Sangria infused with citrus, apples and pears! This Fall Sangria Recipe is super popular and always disappears so fast! Infused with citrus, apples, pears, cherry brandy and cinnamon! I absolutley LOVE sangria. But, truth be told, I almost never order it out in restaurants and choose to drink it at parties. Why? Becuase it’s usually sickeningly sweet. Seriously. And, you know what? Fall Sangria is actually more delicious when there is just a subtle sweetness to balance out the acid, fruit, wine and liquor that is usually added. 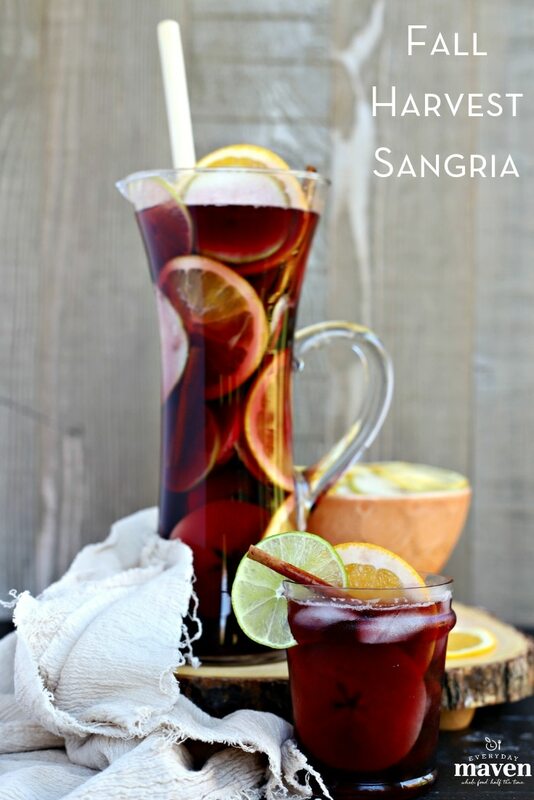 Traditional Sangria (Spanish: sangría [saŋˈɡɾi.a]) is an alcoholic punch from Spain. The base is usually red wine and the Sangria punch has chopped fruit (can vary), some type of sweetener, either orange juice or brandy and is often served with club soda or some other clear soda added to it. Start by cutting or slicing up the fruit. Make a simple syrup with your sweetener. Combine cut fruit, simple syrup, brandy and wine in a large pitcher or container. Refrigerate for 8 to 24 hours. Remove citrus, serve over ice topped off with club soda and fresh fruit garnish. This Fall Sangria recipe has the perfect infusion of apple, pear, citrus and cinnamon with just a touch of coconut palm sugar. Not cloyingly sweet but festive and tastes like a special holiday drink. Perfect for Thanksgiving or any Fall gathering! Gather ingredients and a large pitcher that can be covered or a food storage container. Thinly slice lime, lemon, and clementines into rounds or half-moons. Toss into container with cinnamon sticks. Slice apples in half and use a paring knife to carve out core and seeds. Proceed to slice apples and pears into thin half moon slices and toss into container. Mix sugar with boiling water until dissolved and pour over fruit mixture. Pour in Kirschwasser (Cherry Brandy) and then wine. Close container or cover pitcher with saran wrap. Refrigerate overnight. When ready to serve, remove cinnamon sticks, pour over ice cubes, garnish with fresh cut fruit, and top off with a splash of club soda. Cheers and Enjoy! Kirschwasser is a fancy name for Cherry Brandy. It is also sometimes just called "Kirsch". I used Clear Creek Distillery's Kirschwasser. It is one of the best I know of and a bit expensive, hence why I only purchased what I needed for the recipe. If you really want to save time, use a mandoline to cut your fruit. If you don't usually buy organic fruit, I would recommend you get organic if you can for this since the wine soaks in the fruit overnight. If you can't, just be sure to scrub your fruit really good. Malbec is a type of red wine that is great for Sangria. If you can't find it, get a fruity red wine. So perfect for the holidays! Cheers! Cheers Lindsay – Happy Holidays! I am always us for trying a new sangria recipe! This one looks like a good one! Now this drink is one of my favorites. This is so delicious and it makes my mouth watering. Wonderful combination of ingredients. Thank you Chrissie!! Hope you love it! This looks like a new favorite fall drink! It really is – always a big hit! Sangria is my favorite summer drink! I need to try it with the Fall flavors! Yes!! You will love it! YES, please!!! Such a gorgeous sangria!! i need to make a big pitcher of this next week! This is fall cocktail perfection! I would love to make this with liquid stevia. Any thoughts on how much to replace the other sugar? Thanks. Hi Berneda, I haven’t tried it but I haven’t had much success with mixing stevia with alcohol in the past – it seems to bring out the bitterness! Thanks Faith! I am making another batch tonight to have on hand for all the prep cooking we are doing tomorrow ;). Happy Thanksgiving!